If you are constantly seeing various coupons and pop-ups when you access online shopping websites, better check to see where you have FindBestDeal installed on your computer. It is an adware program that adds extensions to all main browsers and then generates a stream of coupons and shopping suggestions each time to access eBay, Amazon, BestBuy and other similar websites. Naturally, these pop-ups are very annoying, but they can be dangerous too. Thus, you have to remove FindBestDeal from your computer if you want to avoid serious security issues. According to our research, this program is part of coupon adware family. It is a direct copy of DownSave, Isaver, Takethecoupon and other adware programs that randomize their names upon installation. FindBestDeal has a homepage at findbestdeal.org, but this website is useless. There is no direct download link, and it provides basic information that could be applied to any coupon program out there. All of the adware applications from this group employ JustPlug.it extension engine and InstalleRex-WebPick installer. It means that FindBestDeal can enter your system together with other third-party applications that make use of the same installer. In other words, if you have FindBestDeal on your computer, chances are you have a list of other adware applications installed as well. 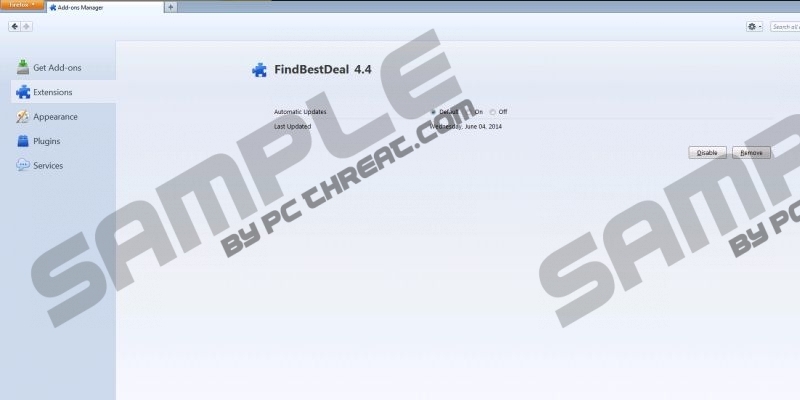 After the installation FindBestDeal adds extensions to all main web browsers. This is how you can be sure that you have this adware program on your computer. Then, each time you access an affiliate shopping website, this adware program will display ads and shopping suggestions. Some users may find these ads annoying, because they can slow down the browser. However, annoying is just one problem. FindBestDeal could prove to be dangerous as well! We have to remember that such adware applications are not safe. They are vulnerable and cyber criminals can exploit them for various purposes. FindBestDeal may redirect you to specific websites to increase their traffic. It could lead you to websites that promote and distribute adware. This program might also indirectly expose you to malware distribution networks. You have to take all these security risks into account. There is no need to keep FindBestDeal on your computer. Open Control Panel and uninstall FindBestDeal from the system. If you see any other unwanted applications, remove them as well. If you do not know which programs need to be deleted, scan the PC with SpyHunter free scanner. It is also a good idea to invest in a licensed computer security application that would help you safeguard your system against similar threats. Also, if you have any further questions, we always encourage you to contact use by leaving a comment in the box below this description. Drag mouse cursor to the bottom right corner of your desktop. Highlight FindBestDeal and click Uninstall. Go to Uninstall a program and remove FindBestDeal. Select Add or remove programs and uninstall FindBestDeal. Quick & tested solution for FindBestDeal removal.